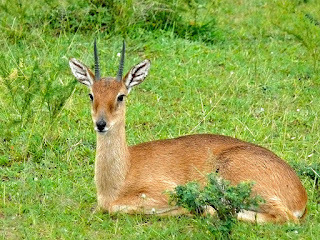 The oribi is a small antelope found in eastern, southern and western Africa. This antelope features a slightly raised back, and long neck and limbs. The glossy, yellowish to rufous brown coat contrasts with the white chin, throat, underparts and rump. Only males possess horns; the thin, straight horns, 8–18 centimetres (3.1–7.1 in) long, are smooth at the tips and ringed at the base. 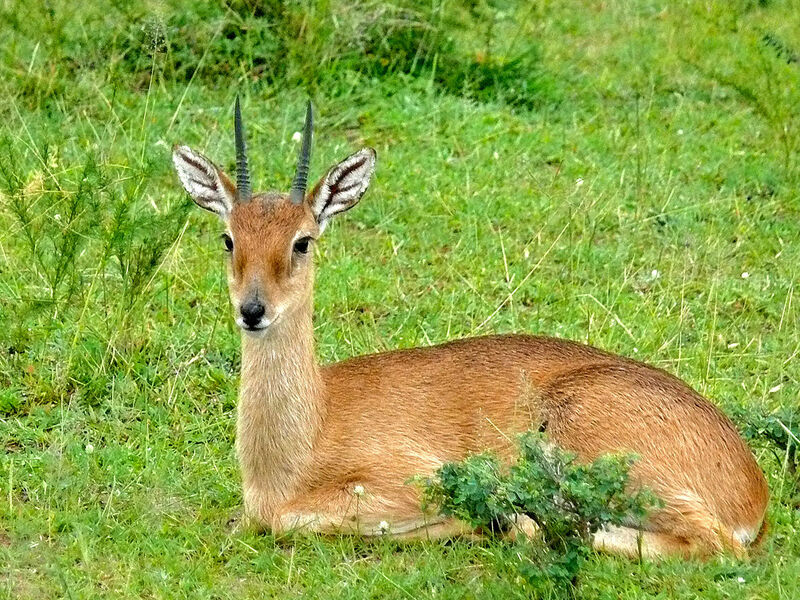 The oribi occurs in a variety of habitats – from savannahs, floodplains and tropical grasslands with 10–100 centimetres (3.9–39.4 in) tall grasses to montane grasslands at low altitudes, up to 2,000 metres (6,600 ft) above the sea level. This antelope is highly sporadic in distribution, ranging from Senegal in the west to Ethiopia and Eritrea in the east and southward to Angola and the Eastern Cape (South Africa). The oribi has been classified as Least Concern by the IUCN; numbers have declined due to agricultural expansion and competition from livestock. Primarily a grazer, which occasionally browse on forbs. Although it occurs on flood plains, it is not dependant on free surface water. Both sexes become sexually mature at 10 to 14 months. A seasonal breeder, the time when mating occurs varies geographically. Mating may peak in the rainy season (August to September). When a female enters oestrus (which lasts for four to six days), it seeks the company of males. During courtship, the male will pursue the female, test her urine to check if she is in oestrus and lick her rump and flanks. Gestation lasts for six to seven months, following which a single calf is born; births peak from November to December in southern Africa. The newborn is kept in concealment for nearly a month; the mother pays regular visits to her calf to suckle it for nearly half an hour. Males may guard their offspring from predators and keep away other males. Weaning takes place at four to five months. The oribi lives for 8 to 12 years in the wild, and for 12 to 14 years in captivity.